Accidental pregnancy isn’t something that most gay men worry about. But in Greg and Ken’s case, a medical miracle turns their lives upside down as they deal with having a baby. I like the concept of this film. As I anticipated watching it I figured it would of course be comedic, but also explore how a gay couple would first react to this as something unexpected, and then how would they deal with a pregnancy differently than a straight couple. And of course given the title, I thought it might also have some political commentary in there as well. There is quite a lead up to how Ken and Greg became a couple. There’s some snap backs to 4 years ago, and we see a lot of detail about what their lives were like before they were together. I usually like this kind of character development as it often gives us a better idea of why people do what they do. In this case, I thought it could have been a little more succinct. When the couple finds out that they’re pregnant it sends them through a range of emotions. Disbelief, excitement, disappointment… I thought their reaction to the pregnancy itself was a little odd, but then I figured that’s not really the point of this – it’s more about them and becoming parents. There is some good stuff here and they start to deal with the pregnancy. Acting here is good and the actors have good chemistry. One of the things I disliked about the film was (without giving too much away) how it moved away from how they dealt with these events as a couple, and more about how each of them coped on their own. I felt like the dramatic argument was undeveloped and out of the blue. At this point the film turned more towards the horrors of being pregnant, and less about the couple and parenthood. The good part of this sequence of events was Thomas, the delivery nurse, played by Chris Salvatore. I liked him in this role, and he played a very sweet, kind person. Interestingly, the budding friendship between Greg and Thomas makes you think certain things may happen between them. I almost wished they had at that point. 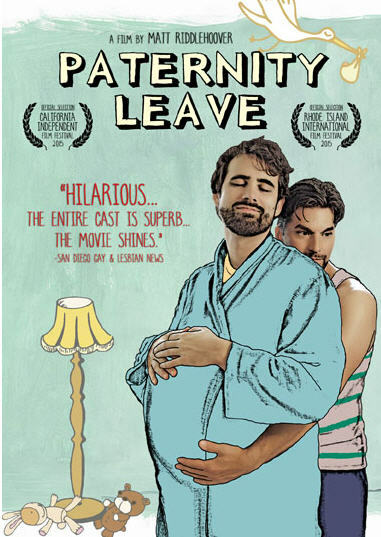 By the end, the film has created a world where men getting pregnant is more commonplace, and there is some commentary on paternity leave. There were some good lines, and the generally positive ending leaves you feeling like all is well. There are parts that could have been more concise and some potential was lost somewhere, but overall it was a good dive into some of the aspects of gay men spontaneously becoming parents.